This is all good news for Redbirds fans, because five of these players have a good chance of playing in Memphis for all or parts of the 2013 season. The Cardinals have already been rated the top minor league system in the game by Baseball America, so the combination of success at both the overall and individual levels points to an optimistic future for the organization. #3 Oscar Taveras, OF: Having played at Double-A Springfield as a teenager, Taveras has always been described as “ahead of the curve” wherever he has been. The athletic right fielder finished the 2012 season in the top three among Texas League hitters in just about every offesnive category, batting .321 with 23 home runs, 94 RBIs, and 37 doubles. Taveras is seen as the right fielder and number three hitter of the future for the Cardinals, but will most likely begin 2013 with Memphis to gain more playing time with Carlos Beltran still manning right field in St. Louis. #25 Shelby Miller, RHP: Miller struggled for the first time in his professional career in the first half of 2012, but a few small adjustments led to a record fo 7-2 with a 2.88 ERA in 57 second-half innings with Memphis and a September call-up to the big leagues. His power fastball has topped out at 97 mph, and his improving curveball and changeup give even more upside to the right-hander. He will enter Spring Training vying for the 5th spot in the Cardinals rotation. If he doesn’t win that battle, Miller could find himself in a bullpen role forthe Cardinals or as a top-of-the-rotation starter for the Redbirds. #33 Carlos Martinez, RHP: Although he has a smaller frame, Martinez brings the heat with a mid- to upper-90s fastball and has garnered comparisons to Pedro Martinez. He reached Double-A Springfield at age 20 and went 4-3 with a 2.90 ERA in 15 games (14 starts) prior to being tabbed as the Game One starter in the Texas League championship series. Some analysts believe Martinez will end up as a dominant reliever in the MLB, but he will continue to pitch as a starter in the minor leagues this season. He could begin the campaign at Double-A, but Redbirds fans should have the opportunity to see him pitch in Memphis at some point this season. #43 Trevor Rosenthal, RHP: Rosenthal has already made his mark at the Major League level, pitching lights out in the 2013 postseason with half of his fastballs clocked at 99 mph or faster. He rose quickly in 2012, starting 17 games for Double-A Springfield and making three starts for Memphis before being called up to pitch out of the bullpen for St. Louis. Rosenthal will have the opportunity in Spring Training to compete for a spot in the Cardinals rotation, but could easily end up in a relief role in St. Louis again, or as a starter with the Redbirds. #79 Kolten Wong, 2B: Wong will begin the season as the Redbirds every day second baseman, although circumstances could see him called to St. Louis anytime throughout the year. He hit .287 with nine home runs, 52 RBIs, 23 doubles, and 21 stolen bases for Double-A Springfield last season. His well-rounded game projects him to be the steady, long-term second baseman that the Cardinals have lacked over the past few years. #83 Michael Wacha, RHP: Wacha was drafted out of Texas A&M in the June, 2012 First-Year Player draft and quickly rose up the ranks of the Cardinals system. He started three games in the Gulf Coast League before appearing in relief four times for both Advanced-A Palm Beach and Double-A Springfield. Wacha will take his sinking fastball and devastating chanegup to the Springfield rotation in 2013 and is expected to be the only one of the Cardinals six Top 100 prospects to not make a stop in Memphis in 2013. This could obviously change if Wacha lives up to his potential and gives The Cards no choice but to promote him. Former Redbird Joe Mather aka “Joey Bombs” signed a minor league contract with the Philadelphia Phillies and was invited to spring training as non-roster invitee. 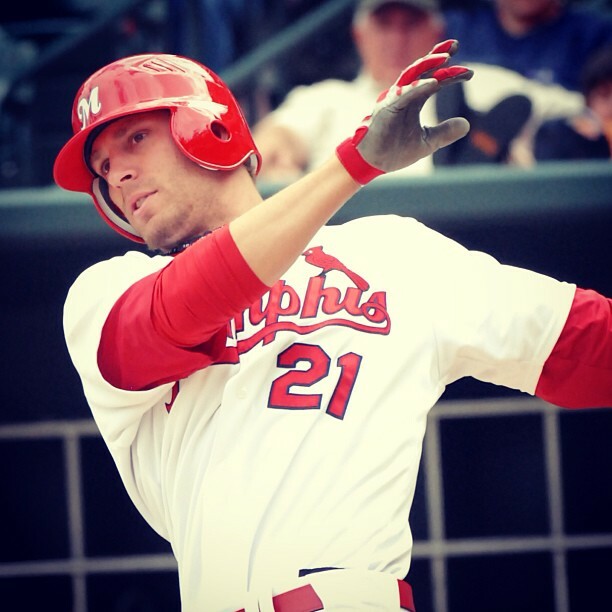 Mather wore a Redbirds jersey during parts of four seasons from 2007-10 and ranks tied for 5th on the Redbirds’ all-time career list with 41 home runs. 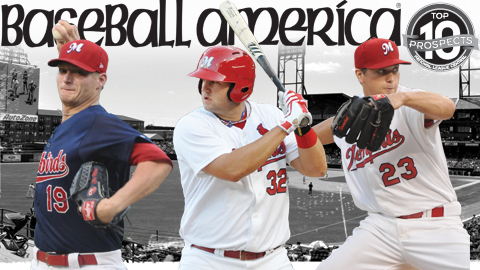 We conclude our in-depth look at former Memphis Redbirds who were ranked among the Cardinals Top 10 Prospects by Baseball America. Other top prospects, such as a #1 Oscar Taveras, #3 Carlos Martinez, and #5 Kolten Wong, are expected to play a big role for the Rebirds in 2013. With all of this returning and incoming talent, there is a lot of excitement heading into this Redbirds upcoming season. At 24 years old, Adams is rated as the “Best Power Hitter” in the Cardinals organization by Baseball America. His swing is described as “compact” and “spring-loaded,” which has allowed him to hit for both power and average over his professional career. In four minor league seasons, Adams has posted a .318 average with 82 home runs and 291 RBIs in 366 games. Adams played 67 games for the Redbirds in 2012, along with a month-long stint with the big Cardinals. With Memphis, Adams batted .329 with 18 home runs and 50 RBIs. Prior to his call-up to the majors on May 20, he was batting .340 and led the team with nine home runs and 27 RBIs in 37 games. Adams recorded two homers, 13 RBIs and six doubles in 27 games with the big league squad before being re-assigned to Memphis. He missed the final month of the season with bone chips in his right elbow. Prior to arriving in Memphis, Adamas racked up a number of accolades at the different minor league levels. He was named 2011 Cardinals Minor League Player of the Year and Texas League Player of the Year, along with Texas League mid-season and post-season All-Stars while with Double-A Springfield. He was also a Midwest League mid-season and post-season All-Star as a member of Low-A Quad Cities. Adams is expected to be the Redbirds’ Opening Day starter at first base, with Allen Craig at the position at the big league level. He was originally drafted by the Cardinals in the 23rd round of the June 2009 draft out of Slippery Rock University of Pennsylvania, where he led Division II in hitting with a .495 average. Be sure to check out the Cardinals Caravan tomorrow at 6:30 pm at Autozone Park. Top Prospect Matt Adams will be in attendance, along with pitchers Michael Wacha and Sam Freeman and Cardinals Alumni Ryan Franklin and Brad Thompson. For information on the Caravan, please call (901) 721-6000. See you there! Today we continue our closer look at the Memphis Redbirds who were ranked among the Top 10 prospects in the St. Louis Cardinals organization by Baseball America. These players make up one of the deepest farm systems in the league and have the opportunity to make an impact at the big league level very soon, if they haven’t already. Rosenthal, who is said to have the “Best Fastball” in the Cardinals system by Baseball America, quickly rose through the Cardinals ranks in 2012, beginning the season with Double-A Springfield and making a pit stop in Memphis before finishing a successful season with the pro club. After being named a Texas League mid-season and post-season All-Star, he made three starts for the Redbirds in August of 2012, compiling a 4.20 ERA (7er/15.0ip) despite not receiving a decision. Rosenthal made four appearances out of the bullpen for the big league Cardinals prior to his stop in Memphis, allowing two runs in 4.0 innings, as well as one scoreless relief appearance with the Cards in between starts for Memphis. He was recalled to the majors for good on August 29. Over the course of the season, Rosenthal made 19 appearances out of the Cardinals bullpen, finishing 0-1 with a 2.78 ERA (7er/22.2ip). He concluded the season by making seven consecutive scoreless appearances. Rosenthal was a member of the Cardinals postseason roster, where he pitched in three games of the National League Division Series against Washington and four games of the National League Championship Series against San Francisco. He threw a combined 8.2 scoreless innings in the playoffs, surrendering two hits while striking out 15. Baseball America noted that half of Rosenthal’s fastballs in the postseason were clocked at 99 mph or faster. This electric fastball, along with his “hard curveball and solid changeup,” earned Rosenthal the #4 ranking among Cardinals top prospects. This spring, Rosenthal will be fighting with Joe Kelly and fellow top prospect Shelby Miller the No. 5 spot in the Cardinals rotation. If he doesn’t win the position in the rotation, Rosenthal could start for the Redbirds in 2013 or end up pitching out of the bullpen for the Cards. Join us tomorrow at 2:30pm to learn more about Cardinals #7 prospect, first baseman Matt Adams. Baseball America recently released its Top 10 prospects for each team in the National League Central. The Redbirds were well represented, with three players from their 2012 roster in the Cardinals’ Top 10, along four others that are expected to make an appearance in Memphis during the 2013 season. Optimism is flowing throughout the Cardinals’ organization, particularly in regards to pitching depth towards the top of the ranks. The Cardinals have had great success developing homegrown talent in recent years, with 11 of the 15 players who appeared in Game Five of the National League Championship Series having started their careers in the Cardinals’ organization. These recent pool of prospects has increased the positive outlook for the future of the club. Currently the top pitching prospect and the top prospect in the Cardinals’ organization the previous three years, Miller has the opportunity to win a spot on the big league roster this coming spring. He will be competing against former Redbirds Joe Kelly and Trevor Rosenthal for the No. 5 starting spot with the Cardinals and two spots in the starting rotation for the Redbirds. Baseball America described his fastball as “overpowering” with “late, heavy movement” that is complimented by a “plus curveball and developing changeup.” Miller struggled in his first 17 starts with the Redbirds in 2012, going 4-8 with a 6.17 ERA. However, he turned things around in his final 57.0 innings pitched, posting a 7-2 record and a 2.88 ERA while compiling a 70-7 strikout-to-walk ratio. His 160 strikeouts in 2012 set a new Redbirds record. Miller’s late-season success earned him a call-up to the pro club in September. Miller took advantage of his time with the pro club, where he made one start and five appearances in relief. Four of his five games out of the bullpen were scoreless before he was given the chance to start on October 3 against the Cincinnati Reds. His start concluded after 6.0 scoreless innings, in which Miller allowed only one hit and two walks while striking out seven. His success at the Major League level earned him a spot on the Cardinals’ postseason roster. He made two appearances out of the bullpen in the National League Championship Series, allowing two runs in 1.1 innings in Game 2 and pitching 2.0 scoreless innings in Game 6. Miller, who was named Pacific Coast League Pitcher of the Week twice as a member of the Redbirds in 2012, had his best professional season in 2011, when he split time between Advanced-A Palm Beach and Double-A Springfield. He concluded the 2011 campaign with a combined record of 11-6 with a 2.77 ERA in 25 starts, striking out 170 and holding opposing hitters to a .219 batting average. Miller was named the Cardinals’ Minor League Pitcher of the Year in 2011 for the second year in a row. He was originally drafted by the Cardinals in the 1st round (19th overall) in the 2009 June Draft and signed the second-largest bonus in club history behind only J.D. Drew in 1998. Check in tomorrow at 2:30pm for a closer look at the Cardinals No. 4 prospect and former Redbird, pitcher Trevor Rosenthal. Right-handed pitchers Shelby Miller (No. 2) and Trevor Rosenthal (No. 4) and first baseman Matt Adams (No .7) have been named Top 10 prospects in the Cardinals organization by Baseball America today. Each player made appearances with Memphis last season and could potentially return for stints with the Redbirds during the 2013 campaign. Click here to see which other future Redbirds made the list. In cased you missed our #twinterview last week with former Redbirds pitcher Michael Blazek, below is the transcript from the conversation. @memphisredbirds: Here we go! @MichaelBlazek34 are you ready to get this#Twinterview started? @memphisredbirds: What’s the biggest difference between starting and being a reliever? Which do you prefer? @memphisredbirds: That’s all from us in Memphis! Thanks to @MichaelBlazek34 for participating in today’s #Twinterview! Good luck next season, Michael!